Welcome to Diamond K Eye Care! Our office is committed to providing you and your family with comprehensive, quality eye care using only state-of-the-art instrumentation, technology, contact lens, and eyewear products. We will strive to exceed your expectations at a level of service and value, without reservation, to ensure you will return and recommend our office to others. We are always looking for ways to improve as a practice, too, so you if you have any suggestions or comments, we’d love to hear from you! We invite all our patients to take advantage of our promotions. Check them out today! We invite all our patients to review our offered optometry services. Please feel free to contact our office to learn more! Complete our online satisfaction survey, fill out patient forms before your visit or learn more about our accepted payment options. Dr. Klufas is a life long resident of Texas. He grew up in San Antonio and pursued his undergraduate degree at Texas A&M University in College Station Texas. 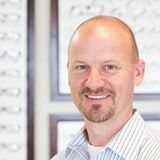 Following graduation with a degree in Biomedical Science, Dr. Klufas continued his education at The University of Houston College of Optometry receiving his degree as a Therapeutic Optometrist in 2001. We are an authorized ZEISS dealer!